This week’s post is another tribute to the past since I am such a fashion history junkie. 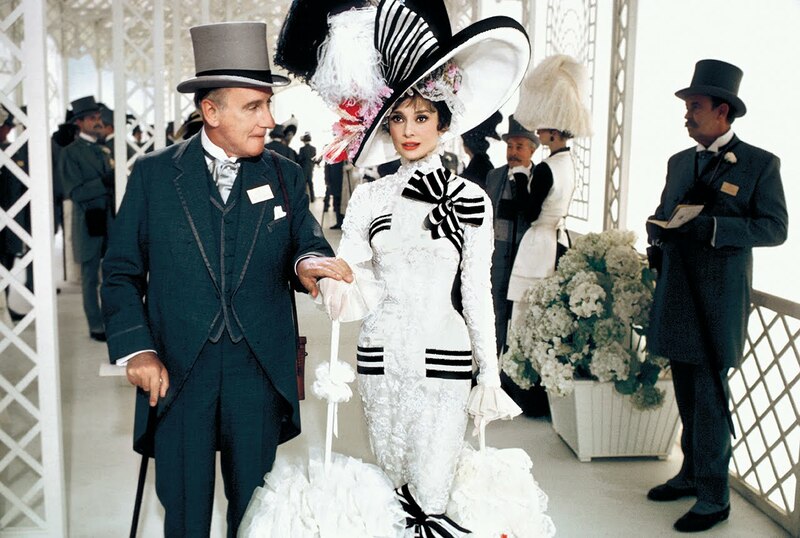 If you have not seen the 1964 Film of My Fair Lady, featuring Audrey Hepburn, you’re seriously missing out. In the Edwardian London, Professor Higgins (a rich, but tactless phonetics expert), makes a bet that he can turn Eliza Doolittle (a young woman selling flowers with a strong Cockney accent) into a proper English speaking lady. The two get to work on Eliza being able to pass off as a duchess at the Embassy Ball. It’s witty, comedic, and it will tug your heartstrings. And not to mention the costumes! Oh god, the flamboyant, stunning, ornate costumes!! I can’t event begin to describe them! *ahem* Anyways, here are some modern day fashion trends that I find reminiscent of My Fair Lady. Audrey looks absolutely stunning here, but let’s focus on the gentleman beside her for now. The three piece suit was the bomb back in the day (and it still kind of is now). But who said only men can wear it? Us ladies can take dapper to a whole new level with our suits. This over-the-top ensemble Eliza wore to her first social outing at the horse races is the most flamboyant costume in the whole movie. Back then, watching horse racing dressed in a whole store’s worth of fabric was a show of wealth. The movie is quite satirical about it! When lace was notoriously difficult to make, the more of it you wore, the better. Thankfully, we don’t need to be wealthy to pull off lace and bows today. This makes me think of pink chiffon cake for some reason… In My Fair Lady, they make a big deal out of eating chocolate since cocoa used to be so expensive that only the rich could afford it. Are you hungry yet? The pink day gown Eliza wears at the end of the film is my favorite outfit. It’s just so frothy and pretty! Anything made of draped chiffon instantly makes an outfit more eye-catching and dimensional. Layering a blouse under a dress- what a chic look that can be both casual and work appropriate. It’s a great look for spring and fall, when it’s too cold for something sleeveless, but too hot for trousers. Also a great look for when you want to be polished, but don’t want to wear a blazer. This outfit is from the famous Rain in Spain scene. Eliza finally starts to overcome her Cockney accent and the reaction is hilarious! What are you still doing here? Go watch My Fair Lady for the love of fashion and let me know if I missed anything else.